NOTES: Some scratchbuilding and some Brengun P.E. parts. ...but I'm getting melancholic. The business. Double kit by Dragon provides two complete sets of parts for construction of either XLR-11 or XLR-99 engined X-15-1 or X-15-2 (short version). The producer chose to best Matchbox in panel lines department. Undoubtedly they succeeded, a feature especially painful if you compare this kit to, say, latest Eduard, or Platz 1/144 releases. Other pitfalls of this kit concentrate in rear area of the fuselage - XLR-11s are badly misinterpreted and the air-brakes and landing skids are very simplified. One also has to pay attention to canopy shape, as there are two variants available and only one of them proper for the short fuselage X-15. It is best not to put complete faith in kit instruction and check other references. Part fit is decent - the parts do fit together, but some gaps remain to be filled. This applies to canopy (if, like me, you chose to leave it in closed position), fuselage front/rear joint, wing roots and engine nozzle part. Dragons take on panel lines and XLR-11 engines were two main headaches to deal with. For the panel lines I applied several coats of primer and sanded it back to bare plastic, hoping this would diminish the broad valleys. Nope. Complete rescribing is recommended for next challengers. Or, c ome to think of it... ditching the panel lines entirely. It is a small, sleek, high speed, airplane. In 1/144. Proper panel shading during painting should suffice. As for the engines: I sanded the whole rear thing flat, applied some putty to get the fuselage shape closer to what reference photos show, and then scratch-built those XLR-11 using plastic rods and 1.2mm brass tubes. At the same time I deepened the upper air-brake interior, preparing the place for PE actuators. I replaced the lower air-brake with PE part, but the fit was rather poor. After all "heavy" work was done I added some more 0,5mm tubes and thin wire to the engine nozzles area, to match what is visible on the photos (at this stage the size of details meant the eyes begged for mercy, or at least something in 1/72 scale). Front gear door was another assembly from Brengun PE set. As for the landing skids - I replaced the support struts with 0.5mm injection needle, and slightly modified the main struts and skids to make them resemble hollow U-profile rather than solid block of metal. I added support strut actuators, which required widening the openings in the fuselage. 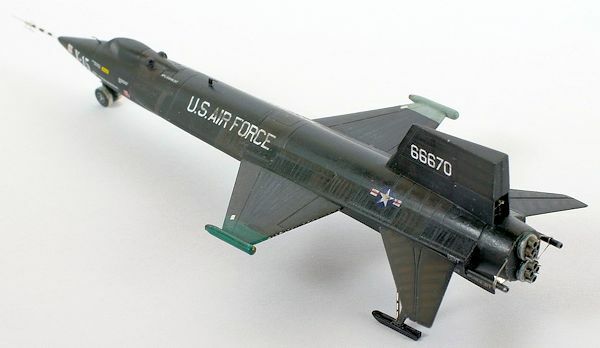 Wingtip pods were made of plastic rod. I also prepared some wire for LOX jettison pipes support - they add a nice extra detail there. Painting started with a coat of Citadel Chaos Black, which I know to be tough and friendly black base. I masked off the areas according to reference photos and sprayed Lifecolor Tensocrom Burnt Brown. Next I masked the wingtips, sprayed GS Base White, and then Pactra RLM65 went to the right and Akan Russian Interior Green to the left. The green looked way too bright, but I left that for later. That was the end of clean and easy work. In comes my trusty brush, and Lifecolor Tensocrom Smoke, Oil, Rust and Burnt Brown and some neutral-to-dark grey mixture. All applied in semi-transparent layers, building-up the effects with near invisible pace. I tried to simulate (a bit) a blueish tint on the upper surfaces, created by blue californian sky reflecting in the surface of the airplane with use of Tensocrom Kerosene. After having achieved the effect that was a step too strong and contrasty I loaded the airbrush with Tamiya Smoke and toned the thing down. It was also a good opportunity to dim that glowing Russian Interior Green on left wingtip. Tamiya Smoke leaves the surface shiny, a good base for decals. Those provided by Dragon were quite good - thin and with minimal film around markings. Nothing is perfect though, as they seem to be incomplete. Again - check your references. I used some Tamiya White to simulate frost on the bottom of the fuselage. Then there was another wave of Tensocrom Smoke and Burnt Brown to blend the decals in, bring back some contrast and introduce some variation in surface glossiness. The final touch was adding fin antennas (PE parts) and nose boom - made of 0.5mm injection needle + wire on top + PE vanes (for which I am very glad that Brengun provided extra one, carpet crawlers...). And the display base. Some cardboard rectangles stacked together, and the top painted to roughly resemble dry lake bed surface. Add some skidmarks, a snake, some water from molten frost below the X-15... and X-15. Finished. I know this model is not perfect. It is far from how I imagined it to be, but then I have to take my skill into consideration, and maybe I aim too high? :) I really wish I dealt with panel lines in a proper way, well... But on the other hand, I am glad that the details I added do give this miniature some more depth. I'd recommend this kit to someone with will and skill to make it into a gem. Otherwise it will remain a toy.